Although a strikeout suggests that the pitcher dominated the batter, the free-swinging style that generates home runs also leaves batters susceptible to striking out. Some of the greatest home run hitters of all time — such as Alex Rodriguez, Gorman Thomas, Reggie Jackson, and Sammy Sosa — were notorious for striking out. A pitched ball is ruled a ball by the umpire if the batter did not swing at it and, in that umpire's judgment, it does not pass through the strike zone. 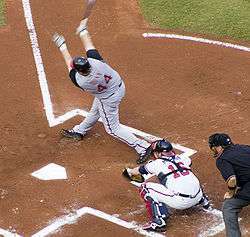 Any pitch at which the batter swings or, that in that umpire's judgment passes through the strike zone, is ruled a strike. Each ball and strike affects the count, which is incremented for each pitched ball with the exception of a foul ball on any count with two strikes. That is, a third strike may only occur by the batter swinging and missing at a pitched ball, or the pitched ball being ruled a strike by the umpire with no swing by the batter. A pitched ball that is struck by the batter with the bat on any count, and is not a foul ball or foul tip, is in play. A batter may also strike out by bunting, even if the ball is hit into foul territory. ↑ Major League Baseball (2001–2009). "Baseball Basics: Abbreviations". Retrieved September 2, 2009. 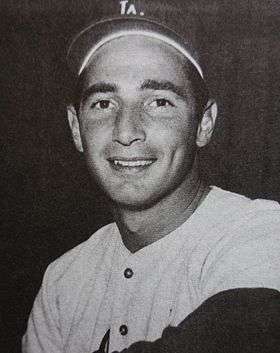 ↑ "The Official Site of Major League Baseball: Official info: Baseball Basics: Abbreviations". Mlb.mlb.com. May 24, 2013. Retrieved June 6, 2013. ↑ "In baseball scoring, why is a strikeout marked with a K?". Thestraightdope.com. Retrieved December 20, 2005. ↑ "Truth&Rumors | K-Rod expects to leave Angels". FanNation. March 22, 2008. Retrieved June 6, 2013. ↑ "Four Strikeouts in One Inning". Baseball-almanac.com. 2011. Retrieved May 12, 2011. ↑ "Fluke or Feat: Ranking the Toughest Single Game Accomplishments in MLB". Bleacherreport.com. 2011. Retrieved May 13, 2011. ↑ "Rare Feats: Four K's in One Inning". mlb.mlb.com. Retrieved August 17, 2012. ↑ Kercheval, Nancy. "Burnett Becomes First New York Yankee to Strike Out 4 in a Single Inning". Bloomberg. Retrieved September 28, 2011. ↑ "Los Angeles Dodgers 11, Cincinnati Reds 7". Retrosheet.org. April 12, 1962. Retrieved October 17, 2010. ↑ "Cooper drives in winning run as Jays beat White Sox in 11th". TSN.ca. August 13, 2012. Retrieved August 14, 2012. ↑ "Bauer K's 5 in first; James hits winner in 12th". Rockfordriverhawks.com. July 1, 2008. Retrieved October 17, 2010. ↑ Schlossberg, Dan (2007). Baseball Gold: Mining Nuggets from Our National Pastime. Chicago: Triumph Books. pp. 302–303. ISBN 978-1-57243-958-0. ↑ "All-Time Career Strikeout Leaders". Espn.com. Archived from the original on July 12, 2007. Retrieved September 29, 2011. ↑ "Historical Leaders, K/9". Baseball-Reference.com. May 25, 2014. Retrieved May 27, 2014. ↑ "Strikeouts Single Season Leaders by Baseball Almanac". Baseball-almanac.com. Retrieved June 6, 2013. 1 2 "Baseball Recordbook 2007" (PDF). Sporting News. p. 63. ↑ "The Baseball Biography Project". Bioproj.sabr.org. Retrieved June 6, 2013.